Yes, you are looking at an image of a tumble drier. My new tumble drier. Not what you thought you’d be reading? No, I guess not. As loyal customers, our power company offered us two free 5-hour slots at a date and time that would suit us, to allow us to use as much energy as we needed and then it would be credited back to our account, effectively making whatever power we used during that time free. I love free things, especially if I can benefit from them and save a little dosh in the process and they’re not someone else’s junk or plastic clutter. 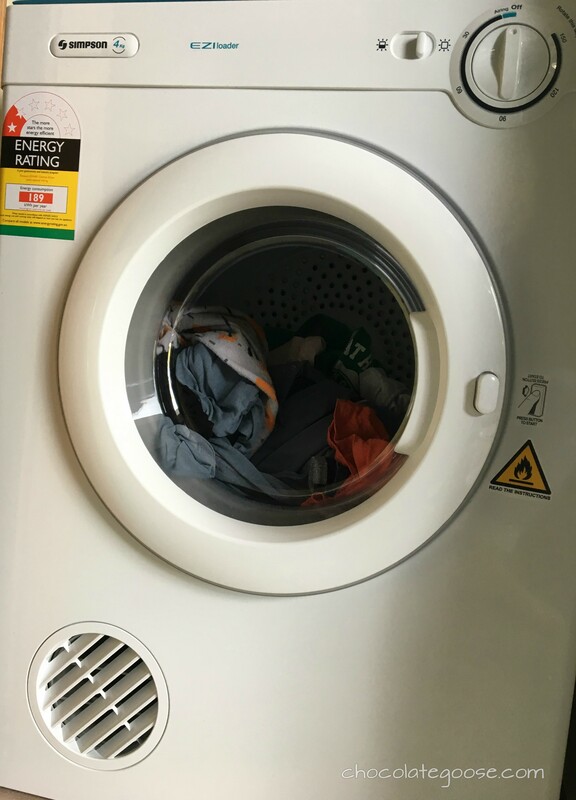 So last Sunday morning my final slot was scheduled and I decided I would do all the washing and then use the tumble drier to enjoy the free power. It was a rainy day and I easily justified throwing everything (within reason, obviously only the clothing items that can be tumble dried) into the drier. Clever Me! So organised! And then it stopped. The tumble drier stopped. A burning smell wafted up from the laundry in the garage and to my dismay, after only 15 minutes, my little tumble drier had died. Literally. 13 years it’s been part of our family. The cheapest little Simpson drier we could find and was one of the first items we bought for our home after landing in New Zealand all those years ago. The trio we splashed out on back then was a Simpson fridge, top load washing machine and the little matching drier. The drier is the first of the triplets to pass on and I have to commend Simpson, not many whiteware appliances last past a decade anymore, without ever once being serviced. With my plan foiled, a mounting pile of wet washing and not a single ray of sunshine around, we embarked on a trip back to the store we bought the originals from to find another deal. Luckily, they are in the process of revamping their store to become the “flagship” so had good deals on offer and lo and behold, the same little drier, albeit the current new model, was once again the cheapest in the shop. It was like it was sitting there waiting for us to collect it. Kudos to the sales man. He tried his very best to show us every other drier in the show room, but eventually he realised that we only had eyes for the little Simpson replacement. If it works anything like it’s predecessor, we hope to have another happy 13 years out of it. I have to admit though, we hardly ever use the drier as most times I can’t justify the extra electricity, and especially as it isn’t very highly rated on the energy-saving scale, but there are those days during a long, wet, grey winter in Auckland that one gets tired of the house looking like a laundy with clothes stands in the way. With the heat pumps on most of the winter, the clothes dry relatively quickly, but they’re still an eye-sore. During the summer and spring, our clothes flap happily in the breezy sunshine on the clothes line outside. So if you happen to be in the market for a tumble drier or washer, I can highly recommend a Simpson. Inexpensive and hardy. Now let’s hope I haven’t tempted fate.